The first edition of the Fused Electronica Weekend was recently announced. The event will be presented by Moving on Music, curated by Phil Kieran and will bring some of the best electronic music to Belfast over three days in June. This first year presents a line-up featuring Andrew Weatherall, Grumbling Fur Phil Kieran and Perc, bringing together techno, electric pop, visuals and live elements. 2015 sees the 20th anniversary of Moving on Music as they continue to programme possibly some of the most exciting and alternative music in Belfast and beyond. The weekender events will continue throughout the year with a three-day Roots event happening in September and a Contemporary weekend in November (more information coming soon). 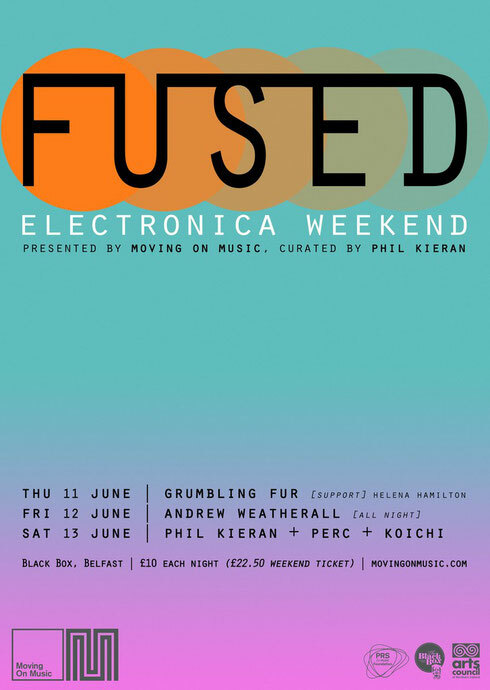 In the meantime, summer starts early with the Fused Electronica Weekend taking place on Thursday 11 to Saturday 13 June at the Black Box. Tickets are priced at £10 per night and £22.50 for all three days.